Stories and crossovers that combine the anime Yu-Gi-Oh with various TV shows (such as Buffy the Vampire Slayer), movies, books and real-life events.. AU oneshot. It is Saturday night. Dawn Summers goes to the Bronze. While there, she attracts the attention of a certain Spirit of the Millennium Ring. What will happen? Read to find out. Oneshot. Songfic to The Thunder Rolls by Garth Brooks. Yami and Téa watch the music video for the song, and then dance to it later. Songfic inspired by A Heart Like Mine by Clint Black. Téa muses on Yami at the park. Yami finds her there, determined that she is the One for him. One rainy night, Dawn Summers is saved from an assailant by Yami Bakura, the Spirit of the Millennium Ring. Oneshot. It is July 4th, aka Independence Day. Yami and Téa go to the fair. There, they listen to a very familiar song — one they like..
A famous actress, who's also starred in commercials for Pepsi, meets someone she never thought she'd see in her life. Namely, the CEO of KaibaCorp himself, with chocolate hair and ice-cold eyes like glaciers. Oneshot. Two former Domino High students are in jail because of what they did to Seto Kaiba and Shizuka Kawaii. What happens when the King of Games, Yugi Moto, meets the vampire Lestat, aka the Brat Prince? Oneshot. Lothos learns the hard way why one doesn’t mess with Yami Bakura. Oneshot songfic to A Kiss from a Rose by Seal and inspired by the 1992 film Bram Stoker's Dracula. Yami and Téa find each other at the park, and they realize they love each other. Kaiba is a vampire. He feeds on criminals such as serial killers, rapists — people who have a death wish. According to one serial killer, Kaiba can easily pass for someone’s older brother. Oneshot. Set to The Good Old Days by Clint Black. Snyder thinks he knows all about the students at Sunnydale High. But there is one student, who not only stands out from the crowd, but is a mystery, even to Snyder himself. Oneshot. Yami thinks about Phoebe Prince and honors her memory. Dedicated to the memory of Phoebe Prince and other victims of cyberbullying who came before her and didn’t deserve to be bullied at all. May she rest in peace..
Yami meets Rebecca Hawkins at a nightclub one night. His secret is that he’s a vampire. Will Rebecca accept him, or will she push him away forever? It’s December, and Buffy is at the Kame Game Shop, where Yugi and Yami both live. She’s trying to overcome her writer’s block by coming up with a poem — not for school, just for fun. But her efforts have failed her. Then Yami helps her out. AU oneshot. Songfic set to Small Town by John Mellencamp. Yami shares with the Scooby Gang his musings of how Sunnydale is kind of a small town, despite all the vampires and demons that come there.. Even Joyce Summers and Seto Kaiba had mothers once. AU. While walking home from a party one night, Yami sees someone being arrested for drunk driving and learns a good lesson in life. Hmm... debit card or credit card. That is the question, as Seto Kaiba knows all too well. After all, being a genius, especially when it comes to matters of money, can be kind of tough. Yami thinks about the tragic trend known as “cyberbullying” — as well as what happened to the victims, among other things. AU. 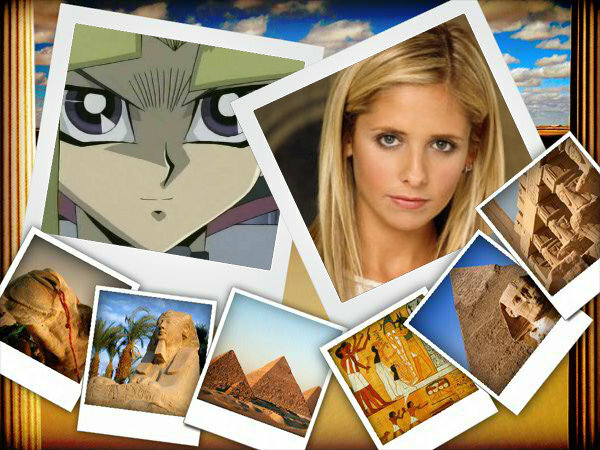 The Pharaoh Atem visits Nights and talks with Xander. Kaiba writes a letter to the last person anyone would see as worthy of receiving any mail from him: Zachary Kralik. AU oneshot. Yami is a sheriff of a town in the Wild West. Songfic to Wild Horses by Garth Brooks. Photo manips I made using PiZap on Facebook, as well as Foto Flexer and Imikimi.com, of course. Oneshot. Inspired by the song Takin’ Care of Business by Bachman-Turner Overdrive. Yami decides to help out the Scooby Gang with their money earning by getting a job of his own. However, the job is anything but what they think Yami would do. Jack O’Toole wonders about Yami Yugi.. AU. Based on the Season 3 episode Anne. Yami comes to Helen’s Kitchen, where Buffy works as a waitress named Anne. Title taken from a line in the song We Tell Ourselves by Clint Black. What happens when Sheila Martini crosses paths with none other than Yami Yugi one night? AU. Mayor Richard Wilkins encounters Pharaoh Atem, aka Yami Yugi, one night and learns some things about him. Yami learns what Ralph Waldo Emerson meant when he said that to have a friend one must be a friend. AU. As the new kid at Sunnydale High, Buffy thinks she’s doomed to be seen as just the “new girl” and be an outcast forever, as well as at the bottom of the popularity totem pole. But a chance meeting in the cafeteria with Atem ‘Yami’ Moto changes her mind for the better. Inspired by the ‘Cafeteria’ commercial for The Foundation for a Better Life. AU. Buffy is a prostitute. Kaiba, Joey and Yami Yugi are vampires who only feed on criminals. One fateful night, Buffy is ambushed by a group of men, and is then rescued by Kaiba, Joey and Yami. Everything changes soon after that.. Being a vampire hero is quite something, especially when the victims that are picked out happen to be rich criminals, too. Kaiba knows this all too well. When Yami comes to Manhattan, Lana falls for him. But he has a deep dark secret — one that Lana doesn’t know about until it is too late, and he leads her into a trap (of sorts)..
Yami Yugi sees something he’s heard most mortals refer to as a “jukebox”. Curious, he tries it out — and takes a liking to it. Theirs was a love that would never die. Instead it was a flame that would burn forever-more. Cavaliershipping. YamixRebecca. Set at the end of the Season 1 episode Witch; AU from there. Yami banishes Amy’s mother Catherine to a place where she can’t hurt Amy ever again, and also changes Amy for the better. Yami is the school genius who comforts Lana Weinberger after she is rejected by her friends and boyfriend. Kaiba watches the Pepsi Girl while she dances on top of the bar. With a nod to George Michael and his song Father Figure. Yami reflects on Tupac Shakur, the Notorious B.I.G. and what happened to them. Atem finds Andrew in the library.. AU. Jack O’Toole realizes a few things about Yami Yugi.. AU. When Seto Kaiba comes to the Tipton Hotel for a vacation, Zack and Cody are thrilled, as are Maddie and London. AU songfic oneshot. Set to At the Beginning by Donna Lewis and Richard Marx. Yami spends a night with Buffy, Xander and Willow. Andrew watches Atem in the battle with the Turok-Han vampires, and realizes a few things about him.. AU. Set after Helpless in Season 3. Quentin Travers is challenged to a game of chess by an opponent he thought he’d never face one day.. AU. Giles and Yami have a late-night chat in the library at Sunnydale High. AU. Set after The Pack in Season 1. Atem Moto, who is a brilliant student and prefers to be called ‘Yami’, meets with Principal Flutie to ask about his grades. Flutie has learned some things about Yami in the process, of course. AU. Yami writes in his journal about being a vampire hero — as well as killing the man they called the ‘Fuehrer’ on the fateful day of April 30, 1945. Songfic to Like the Rain by Clint Black. Yami shows Téa what passion and fire are, and consumes her with his fire. AU oneshot. Yami thinks about the invention known as the jukebox at a diner, as well as how it came to be before his thoughts turn to something else. Prompt was "jukebox". Oneshot. Yami is a cowboy who admires wolves. Songfic set to Wolves by Garth Brooks. After discovering Cody has gotten a good grade on a math test, Kaiba takes him out to eat at McDonald's. While there, Kaiba explains the benefits of a debit card, and Cody is quite interested. AU. Yami takes on a serial killer who believes himself to be Jack the Ripper one night, while Spike and Andrew watch from afar. AU of the Season 1 episode The Pack. Yami shows four familiar bullies why it is never a good idea to pick on a Pharaoh — especially a former Pharaoh such as himself..
Set during the Season 3 episode The Zeppo, then goes AU from there. Jack O’Toole encounters Seto Kaiba and learns a few things about him in the process. AU oneshot. While watching Cody work on his math homework, Kaiba muses on Cody and what his future would possibly be like. Yami Yugi muses about the love of his life while sitting on a rooftop in Gotham City. AU. Kaiba drains the blood of an abusive pimp one night.. AU. Kaiba spends some time with five-year-old Buffy, who he sees as the little sister he’s always wanted, but never got. Inspired by the songs Love The Way You Lie (parts 1 and 2) by Rihanna and Eminem. Yami is a vampire hero who goes undercover as a male prostitute and feeds on criminals.. The gang meets pop star Nick Lachey and learn he’s going through a divorce from Jessica Simpson. Yami, a Vampire Prince, helps him, and finds a mate. AU. Yami is an ethical vampire, and feeds on the criminals. Things like whether they happen to be young or old (or male or female) do not seem to phase him one bit. Title from the lyrics in If Everyone Cared by Nickelback. AU. Yami and Kaiba are Vampires. Yami rescues a young girl, Sarah, from her home one night. Warning: contains domestic violence. Yami is a vampire count looking for a mate three days before he turns 16 years old. Arella is a young girl looking for someone to love. She becomes Yami’s wife, and helps Kaiba, Yami’s friend, to find a mate as well. YamixOC, KaibaxOC. Warning: Rated M for blood and strong sexual scenes; don’t like, don’t read. Yami, the king of all vampires, rescues a little girl from an abusive father. Over time, the two grow to love each other like family — and even more than that. Yami Yugi sings the Diet Pepsi song with Téa, and then goes to Ray Charles’ grave to pay his respects. AU. Yami goes to Willy’s Place and talks to Willy, the bartender..
Set after the 1991 remake of Cape Fear. Max Cady finds himself in the Shadow Realm..
Yami attends the funeral of Selena Quintanilla-Perez, and muses about her..
A new girl makes friends with Serenity, and finds the courage to stand up to the school bully Atem Moto — who’s also a heartbreaker with the girls..
Yami reflects on Kurt Cobain, who committed suicide on April 5, 1994. Rated T just to be safe. Buffy writes a poem about a certain duelist that has brown hair, blue eyes and is associated with the trademark Blue Eyes White Dragon..
An original character’s thoughts on Seto Kaiba and how he can be a mystery to most people as well.. He always watches me under the moonlight. But why he never did so during the day, I’ll never know; but he saved me from my father. And so, ever since that day, he has always been my moonlight knight. (Yami X OC).. AU. Yami attends Sunnydale High with Buffy and her friends, and also helps them out in the process. AU. Kaiba wakes up and gives Buffy, Yugi and their friends a confession of sorts..
Caleb finds himself in the Shadow Realm. But he soon discovers that he’s not alone there..
Yugi gets lost on the way home one night, where he meets a fearsome creature of the night: the vampire. Sequel to Bitten. The vampire, Yami, is back for Yuugi again — and this time, he wants more than blood..
My thoughts on how Yami Yugi could’ve taken on Glory, Warren and Caleb in a battle.. AU. Yami works as an exotic dancer at the Crazy Horse. One night Mai Valentine comes along and learns a lesson from Yami, as well as a few things about him. Rated T to be safe, though there are mentions of pole dancing and a lap dance. Regalshipping. AU. Yami plays the guitar and discovers something neat about the instrument. AU. Yami gives Joyce a Mother’s Day card, and she appreciates it, as do Buffy and Faith.. AU. What happens when Yami Yugi comes to Gotham City and takes on Batman’s rogues gallery and the other criminals there..? Photomanips and fan art of the crossover between Yu-Gi-Oh and the Batman films (from 1989 to 1997, as well as the ones from 2005 to 2012). AU. Spike gets a letter from Yami Yugi, advising him to visit Egypt in Africa. An original character’s thoughts on Seto Kaiba as a vampire.. There are two new guys at Bayside High. Popular girl Muffy falls for one of them. Drama and suspense soon happen. A sequel to “BtVS/Yu-Gi-Oh Crossover Manips” with more drama, more romance (kind of), and more life situations..
Yugi is a lonely teen who has to do a report on vampires for school. Soon he meets a vampire named Yami. As they get to know each other, Yugi falls in love with Yami and vice versa. However, as gentle as he seems, Yami is still a creature of the night, and has those vampire instincts.